Others argue the consequences would outweigh any economic advantage. Crime heavy along border in San Ysidro, California, El Paso and Tucson, Arizona. (CNN) -- While Congress is considering major spending requests for security along the Mexican border to help curb drug violence, others are proposing a less-expensive but, some say, dangerous solution: decriminalizing drugs. 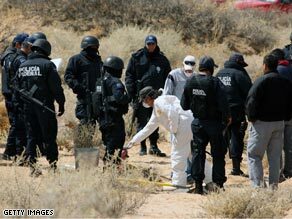 Federal police investigate a crime scene in Juarez. There have been about 1,000 drug-related deaths in Mexico so far this year. "It's the least worst option to ending the cartel violence," El Paso, Texas, city Councilman Robert O'Rourke told CNN in a phone conversation last week. "I thought our drug laws were silly, but you don't realize how big of a problem you're facing until it really gets brought home for you in your community." O'Rourke knows what it's like to live in a border town gripped by drug violence. El Paso and its Mexican sister city Juarez share a street grid system, among other things. "We feel the violence every day," O'Rourke said. "The cartels control [Juarez], and that spills over onto the U.S. side. Decriminalizing drugs would take away a lot of the financial incentive for the cartels to kill. The violence would go down." The military response launched by Mexican President Felipe Calderon in December 2006 seems to have led to even more violence in Mexico border towns. Official dialogue is virtually nonexistent between the cartels and the Mexican government. There have been about 1,000 drug-related deaths so far this year, suggesting the violence may be worse in Mexico than in 2008, when more than 6,000 drug-related killings occurred across the country. Most of the killing is concentrated in border towns near U.S. cities such as San Ysidro, California, El Paso and Tucson, Arizona. Tucson, 50 miles from the border, is a traffic hub for the cartels, which smuggle everything from drugs to guns to people. The city's troubles, notably home invasions that appear to be modeled on cartel drug-related hits, have gotten the attention of Congress. "Tucson faces the toughest challenges in the drug war," U.S. Rep. Harold Rogers, a Republican from Kentucky and a ranking member of the House Appropriations Committee on Defense, said last week during a hearing with U.S. Customs and Border Protection officials. He said he has called for "at least a rational discussion" on ways to take the profit out of marijuana and look at drug treatment. "Frankly, we would have a profound impact on demand," he said. To O'Rourke, a rational discussion translates into an honest conversation about possible solutions to the drug war, even if that means decriminalizing drugs such as marijuana and cocaine. Goddard was more conservative with his language in a statement provided to CNN. In it, Goddard said he does not favor legalizing marijuana in the United States, and is "committed to fighting back against those who traffic any illegal drug across [the] border or in communities." But, supporters say, legalizing drugs like marijuana also would energize a slumping economy. In California, which is billions of dollars in debt, state economists and politicians including U.S. Rep. Loretta Sanchez have said legalizing marijuana would pump $1 billion into the state budget. Others say the consequences of decriminalizing drugs would outweigh any economic advantage. "No way. We would lose a generation," Rodney Benson, special agent for the federal Drug Enforcement Administration, said recently on CNN. Contacted by CNN for further comment, Benson said he could not speak further about decriminalization at this time because "the issue is at the White House level and all policies are being reviewed." Other critics claim legalization would lead drug addicts to seek refuge in cities with laws that would help them foster their addiction. Some on both sides of the debate also say they're not sure decriminalization would make a noticeable dent in the Mexican drug war. "The violence ebbs and flows," said Ethan Nadelmann, executive director for the Drug Policy Alliance, a group which favors a national discussion about legalization. "We're going to see the violence in Mexico go down, but the issue of decriminalization needs to be put out there as an option. The problem is, once you mention the idea, you face the possibility of character assassination." Despite the stigma behind the idea of decriminalization, O'Rourke said the possibility for dialogue is not dead. And as the violence continues to spread into the United States and even further into southern Mexico, some say the "least worst option" to ending the drug related violence could quickly become the best.